Bennett Brinson Gamel: Fighting Cystic Fibrosis: His rectal prolapse has returned. Now what? I haven't written anything about it. Maybe it's due to a bit of denial. Mostly, I think, it's due to my just not wanting to worry about this problem until I really had to. But I guess now is the time. Bennett's rectal prolapse returned in early November. I knew, when Bennett told me in November his rectal prolapse had "come out again," we were likely looking at another surgery to fix it. But I had really hoped that the rectal prolapse would not be a chronic issue. I had hoped that maybe we could buy some time through the holidays, maybe in to the summer?! However, like every other bout with this issue, once Bennett has rectal prolapse issues, they only get worse over time. It's hard to believe we are even dealing with this again. It was only one year ago, almost to the day, that Bennett last had surgery to correct his rectal prolapse. And it was only 6 months ago, Bennett was under the knife for sinus surgery. I'm so tired of surgeries. Surgeries are better than suffering. But sometimes it feels like they are one in the same. Throughout November, I wanted to ignore that we were going to have to deal with Bennett's rectal prolapse until Bennett unexpectedly drew me a crayon picture of his rectal prolapse with a line crossed through it. He held it up and said, "this is how I feel about my rectal prolapse." I knew he was telling me in his 6-year-old way, he had had enough. It was when Bennett told me right before Christmas, "at school today, when my rectal prolapse came out, I just kept saying to myself, 'mommy's here. mommy's here. mommy's here," that I realized his continued issues with rectal prolapse was taking an emotional toll on him. Last week, it became clear that Bennett's rectal prolapse is happening every day, multiple times a day. Rectal prolapse doesn't hurt him. But it is bothersome. His self esteem and lack of independence when going to the potty have become strong motivations to address it. Recently, I realized I probably should begin talking to him about what might be in his future. I said, "Bennett, you know we'll probably have to have surgery to get your rectal prolapse fixed. Will that be ok?" Bennett nodded. I was a bit surprised by his quick affirmation that that was ok. Maybe he had forgotten what surgery was like? Then he asked, "will I get Popsicles?" He asked, "will they put me to sleep?" He asked, "Will my Daddy tickle me when I get that medicine that makes me feel silly?" He knows the drill. And in that moment, both Bennett and I were mentally preparing for surgery. I was dreading it. But Bennett was remembering the parts of surgery he likes. This is the best possible scenario going forward. As Bennett gets older and knows what is going on, I want him to begin to lead on these decisions. Fixing Bennett's rectal prolapse is likely best addressed by surgery. But when we do surgery is a bit up to us. 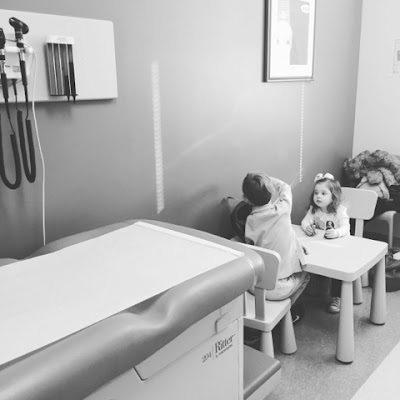 The Pediatric Surgeon has relied on me to tell her when the issue, in its current form, is too much to deal with. This time, I have tried to lean on Bennett to indicate this to me. Now, Bennett is beginning to be able to join the conversation. Do you want to fix this? Do you understand what it will mean for us to fix this? Do you understand what it will be like? These are the questions I have wanted to help work through with him. But I was surprised to see him so quickly tick off affirmative answers to each of those questions. Bennett's Pediatric Surgeon reminded me today that he is smart. Bennett's play therapist reminded me this week that he is perceptive. I already know he is brave. So, as much as I try to protect him, the truth is God has already given him everything he needs to help protect himself. In the next blog post, I'll share what came of today's appointment with the surgeon. Oh Breck, I am so sorry. I think it was just a crapy CF day. What a sweet boy and so smart that he understand what is going on. Good luck with it all!